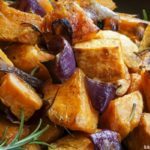 Roasted Sweet Potatoes are so yummy and delicious! I used to make them all the time, I don’t know why I forgot about this recipe. In my quest to continue to eat clean and healthy this recipe came to mind. It was super easy and my kids LOVED it! Looks like we will be adding Roasted Sweet Potatoes to the dinner rotation. I made a pork tenderloin in the crock pot and served with a side of green beans and a salad. You’ll find more healthy recipes here. Wash sweet potatoes and chop into cubes. 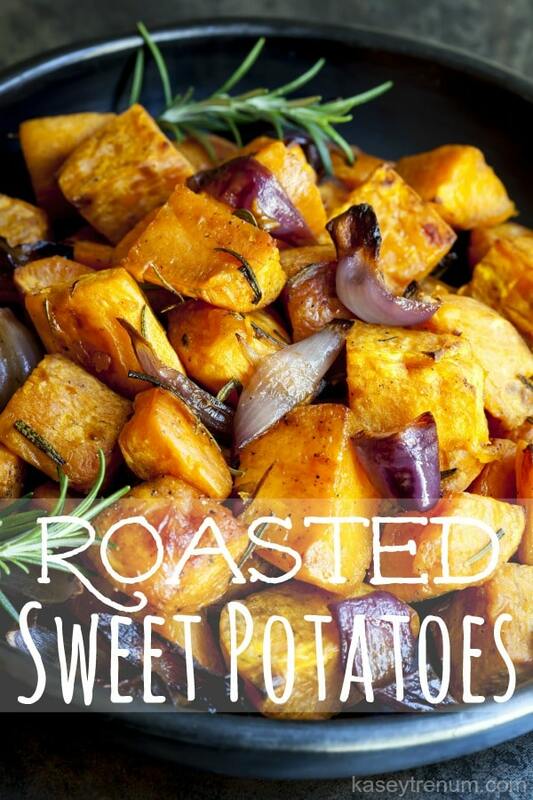 Combine sweet potatoes, onions, olive oil, honey, cinnamon, and rosemary in a bowl and stir until coated. Spray cookie sheet with cooking spray, then spread sweet potato cubes evenly. Cook for 35-45 minutes, stirring periodically during cooking. Made these for thanksgiving. I have to say, I wasnt sure about leaving the skin on sweet potatoes, but they turned out awesome! This one is a keeper! How many servings does the receipe serve?? I served it to my family of four. Depending on how much your family eats you’ll want to add more or less. Can you substitute avocado oil for coconut oil? I’ve only made the recipe as is but I would think it would work. How much honey? Its not listed in the ingredients, but its mentioned in the instructions . I’m planning to make this for a Christmas party tomorrow. I just eyeball it and pour a little on top.